Area: 241,038 sq. km. (93,072 sq. mi. ); about the size of Oregon. Cities: Capital: Kampala (2009 pop. 1.5 million). Other cities — Gulu, Lira, Jinja, Kasese, Mbarara, Mbale. Terrain: 27.9% of land area is arable, 11.2% is permanent cropland, and 17.5% is forest. Climate: Tropical; generally rainy with two dry seasons (December to February, June to August); semiarid in northeast. Nationality: Noun and adjective — Ugandan(s). Annual population growth rate (2010 est. ): 3.2%. Ethnic groups: Baganda, Banyankole, Bahima, Bakiga, Banyarwanda, Bunyoro, Batoro, Langi, Acholi, Lugbara, Karamojong, Basoga, Bagisu, and others. Religions (2009): Christian 85%, Muslim 12%, other 3%. Languages: English (official), Swahili (official), Luganda, and numerous other local languages. Education: Attendance (2010; primary school enrollment) — 91%. Literacy (2010) — 73.2%. Health (2010 est. ): Infant mortality rate — 63/1,000. Life expectancy — 53 years. Constitution: Ratified July 12, 1995; promulgated October 8, 1995. Branches: Executive: president, vice president, prime minister, cabinet. Legislative — parliament. Judicial — Magistrates' Courts, High Court, Court of Appeals (Constitutional Court), Supreme Court. Political parties: 38 registered parties. Major political parties include the National Resistance Movement (NRM, the ruling party), Forum for a Democratic Change (FDC), Democratic Party (DP), Conservative Party (CP), Justice Forum (JEEMA), and Uganda People's Congress (UPC), among others. National holiday: Independence Day, October 9. GDP (nominal, 2010): $17.02 billion. Natural resources: Copper, cobalt, hydropower, limestone, salt, phosphate, oil. Agriculture: Cash crops: coffee, tea, cotton, tobacco, cassava (tapioca), potatoes, corn, millet, cut flowers. Food crops — bananas, corn, cassava, potatoes, millet, pulses. Livestock and fisheries — beef, goat meat, milk, poultry, Nile perch, tilapia. Industry: Processing of agricultural products (cotton ginning, coffee curing), cement production, light consumer goods, textiles. Trade: Exports (2010): $2.9 billion: coffee, fish and fish products, tea, tobacco, textiles, cement, maize, electricity. Major markets — South Sudan, European Union, Kenya, Rwanda, Democratic Republic of the Congo. Imports (2010) — $4.5 billion: petroleum, road vehicles, cereals, industrial machinery, iron and steel, medical/pharmaceutical supplies. Major suppliers — Kenya, United Arab Emirates, China, India, South Africa, Japan, Germany. Fiscal year: July 1-June 30. The Baganda are the largest ethnic group in Uganda and comprise approximately 17% of the population. Individual ethnic groups in the southwest include the Banyankole and Bahima (10%), the Bakiga (7%), the Banyarwanda (6%), the Bunyoro (3%), and the Batoro (3%). Residents of the north include the Langi (6%) and the Acholi (5%). In the northwest are the Lugbara (4%). The Karamojong (2%) occupy the considerably drier, largely pastoral territory in the northeast. Ethnic groups in the east include the Basoga (8%) and the Bagisu (5%). Uganda's population is predominately rural, and its population density is highest in the southern regions. Asians constituted the largest nonindigenous ethnic group in Uganda until 1972, when the Idi Amin regime expelled 50,000 Asians who had been engaged in trade, industry, and various professions. After Amin's overthrow in 1979, Asians slowly began returning, but Uganda's Asian population has never reached its pre-1972 numbers. Britain granted internal self-government to Uganda in 1961, with the first elections held on March 1, 1961. Benedicto Kiwanuka of the Democratic Party became the first Chief Minister. Uganda maintained its Commonwealth membership. A second round of elections in April 1962 elected members to a new National Assembly. Milton Obote, leader of the majority coalition in the National Assembly, became prime minister and led Uganda to formal independence on October 9, 1962. In succeeding years, supporters of a centralized state vied with those in favor of a loose federation and a strong role for tribally-based local kingdoms. Political maneuvering climaxed in February 1966, when Prime Minister Milton Obote suspended the constitution, assumed all government powers, and removed the ceremonial president and vice president. In September 1967, a new constitution proclaimed Uganda a republic, gave the president even greater powers, and abolished the traditional kingdoms. On January 25, 1971, Obote's government was ousted in a military coup led by armed forces commander Idi Amin Dada. Amin declared himself president, dissolved the parliament, and amended the constitution to give himself absolute power. Idi Amin's 8-year rule produced economic decline, social disintegration, and massive human rights violations. The Acholi and Langi ethnic groups were particular objects of Amin's political persecution because they had supported Obote and made up a large part of the army. In 1978, the International Commission of Jurists estimated that more than 100,000 Ugandans had been murdered during Amin's reign of terror; some estimates place the figure much higher. In October 1978, Tanzanian armed forces repulsed an incursion of Amin's troops into Tanzanian territory. The Tanzanian force, backed by Ugandan exiles, waged a war of liberation against Amin's troops and Libyan soldiers sent to help him. On April 11, 1979, Kampala was captured, and Amin fled with his remaining forces. After Amin's removal, the Uganda National Liberation Front formed an interim government with Yusuf Lule as president. This government adopted a ministerial system of administration and created a quasi-parliamentary organ known as the National Consultative Commission (NCC). The NCC and the Lule cabinet reflected widely differing political views. In June 1979, following a dispute over the extent of presidential powers, the NCC replaced Lule with Godfrey Binaisa. In a continuing dispute over the powers of the interim presidency, Binaisa was removed in May 1980. Thereafter, Uganda was ruled by a military commission chaired by Paulo Muwanga. December 1980 elections returned the UPC to power under the leadership of President Obote, with Muwanga serving as vice president. Under Obote, the security forces had one of the world's worst human rights records. In their efforts to stamp out an insurgency led by Yoweri Museveni's National Resistance Army (NRA), they laid waste to a substantial section of the country, especially in the Luwero area north of Kampala. Obote ruled until July 27, 1985, when an army brigade, composed mostly of ethnic Acholi troops and commanded by Lt. Gen. Basilio Olara-Okello, took Kampala and proclaimed a military government. Obote fled to exile in Zambia. The new regime, headed by former defense force commander Gen. Tito Okello (no relation to Lt. Gen. Olara-Okello), opened negotiations with Museveni's insurgent forces and pledged to improve respect for human rights, end tribal rivalry, and conduct free and fair elections. In the meantime, massive human rights violations continued as the Okello government murdered civilians and ravaged the countryside in order to destroy the NRA's support. Negotiations between the Okello government and the NRA were conducted in Nairobi in the fall of 1985, with Kenyan President Daniel Moi seeking a cease-fire and a coalition government in Uganda. Although agreeing in late 1985 to a cease-fire, the NRA continued fighting, seized Kampala in late January 1986, and assumed control of the country, forcing Okello to flee north into Sudan. Museveni's forces organized a government with Museveni as president and dominated by the political grouping called the National Resistance Movement (NRM or the "Movement"). A referendum was held in March 2000 on whether Uganda should retain the Movement system, with limited operation of political parties, or adopt multiparty politics. Although 70% of voters endorsed retention of the Movement system, the referendum was widely criticized for low voter turnout and unfair restrictions on Movement opponents. Museveni was reelected to a second 5-year term in March 2001. Parliamentary elections were held in June 2001, and more than 50% of contested seats were won by newcomers. Movement supporters nevertheless retained firm control of the legislative branch. Observers believed that the 2001 presidential and parliamentary elections generally reflected the will of the electorate; however, both were marred by serious irregularities, particularly in the period leading up to the elections, such as restrictions on political party activities, incidents of violence, voter intimidation, and fraud. A July 2005 national referendum resulted in the adoption of a multiparty system of government, but in September 2005 Uganda's parliament amended the constitution to remove term limits for the president, enabling President Museveni to run again in the 2006 elections. In February 2006, the country held its first multiparty general elections since 1980. Ruling NRM candidate President Museveni was declared the winner with 59% of the vote, giving him a third term in office. Opposition Forum for a Democratic Change (FDC) leader Kizza Besigye captured 37% of the vote, while the remaining contestants received less than 2% of the vote each, according to official figures from the Electoral Commission. Besigye challenged the results in Uganda's Supreme Court, which ruled that serious irregularities had occurred but were not significant enough to alter the outcome of the elections. On February 18, 2011, Uganda held its fourth presidential and parliamentary elections since Museveni came to power. Seven opposition presidential candidates, including FDC leader Kizza Besigye (the Inter-Party Cooperation candidate) ran against Museveni. On February 20, the Electoral Commission declared Museveni the winner with 68% of the vote; Kizza Besigye came in second with 26% of the vote. The 1995 constitution established Uganda as a republic with executive, legislative, and judicial branches. The constitution provides for an executive president, to be elected every 5 years. President Yoweri Museveni, in power since 1986, was elected in 1996 and reelected in 2001, 2006, and 2011. Legislative responsibility is vested in the parliament; legislative elections are held every 5 years. Because of redistricting, the parliament elected in February 2011 grew from 332 to 375 members, including 112 special seats for women, 10 special seats for military, five for youth, and five for persons with disabilities. The Ugandan judiciary operates as an independent branch of government and consists of magistrate's courts, high courts, courts of appeals (which also function as constitutional courts), and the Supreme Court. Parliament and the judiciary are independent bodies and wield significant power. Uganda maintains an embassy (http://www.ugandaembassy.com/) in the United States at 5911 16th Street NW, Washington, DC 20011 (tel. 202-726-7100). After decades of internal strife, Uganda has experienced more than 20 years of relative political stability and economic growth. However, rampant corruption and one of the world's highest population growth rates present challenges to the country's continued economic growth and political stability. Uganda's constitution provides for freedom of speech, religion, and movement. Press and civil society enjoy relative freedom. However, the government sometimes uses charges of unlawful assembly, inciting violence, and promoting sectarianism to curtail government critics' freedom of speech and assembly. In 2011, Ugandan security forces used live ammunition, tear gas, rubber bullets, and water cannons to disrupt opposition-led protests against rising prices, leaving at least 10 dead and many more injured. In September 2009, the government's restriction on the travel of the Buganda Kingdom's prime minister to Kayunga district, combined with incorrect reports of the prime minister's arrest, sparked 3 days of riots in Kampala that left at least 40 people dead and many more injured. The vicious and cult-like Lord's Resistance Army (LRA) operated from 1986 to 2006 in northern Uganda, where it killed tens of thousands of people, abducted thousands of children to serve as soldiers and slaves, and displaced approximately 1.8 million Ugandans. In 2005, the Ugandan military pushed the LRA out of northern Uganda and into neighboring Democratic Republic of the Congo (D.R.C.). In December 2008, the Governments of Uganda, the D.R.C., and Southern Sudan launched a joint military operation against the LRA in northeastern D.R.C., dispersing groups of LRA fighters across the D.R.C., Central African Republic, and Southern Sudan (now South Sudan), where the group continues to commit atrocities against local populations. In 2011, the United States sent a small number of military advisers to the LRA-affected region to enhance the capacity of the Ugandan and other regional militaries to pursue the LRA and protect civilian populations. There have been no LRA attacks in northern Uganda since August 2006. As a result, the vast majority of the 1.8 million former internally displaced persons (IDPs) have returned to or near their homes. Assistance from the Government of Uganda through its Peace, Recovery and Development Plan (PRDP) and from international donors has helped communities in northern Uganda rebuild and recover from the 20-year humanitarian catastrophe caused by the LRA. Since assuming power in early 1986, Museveni's government has taken important steps toward economic rehabilitation and adopted policies that have promoted rapid economic development. The country's infrastructure — notably its transportation and communications systems that were destroyed by war and neglect — is being rebuilt. Recognizing the need for increased external support, Uganda negotiated a policy framework paper with the International Monetary Fund (IMF) and the World Bank in 1987. It subsequently began implementing economic policies that resulted in a consistent pace of economic growth. Uganda was the first country to be eligible for the Heavily Indebted Poor Countries (HIPC) initiative and had virtually all of its foreign debts forgiven by the IMF, World Bank, and major donors. Growth rates in fiscal years 2009 and 2010 were 7.2% and 5.2%, respectively. Food prices rose dramatically in 2011 and average annual inflation was 18.7%, the largest increase in two decades. The service sector was the largest contributor to GDP in 2010 (at 50%). Manufacturing and agriculture contributed 26% and 24%, respectively. Despite their dwindling shares of Uganda's GDP, the agriculture and fishing sectors provide approximately 80% of employment in Uganda. Uganda is Africa's second-leading producer of coffee, which accounted for about 17% of the country's exports in 2009 and 2010. Exports of nontraditional products, including apparel, hides, skins, vanilla, vegetables, fruits, cut flowers, and fish, are growing, while traditional exports such as cotton, tea, and tobacco continue to be mainstays. Most industry is related to agriculture. The industrial sector has been rehabilitated and resumed production of building and construction materials, such as cement, reinforcing rods, corrugated roofing sheets, and paint. Domestically-produced consumer goods include plastics, soap, cork, beer, and soft drinks. Oil experts estimate Uganda's Albertine Basin has about 2.5 billion barrels of recoverable oil, positioning Uganda to become one of sub-Saharan Africa's top oil producers and potentially doubling current government revenues within 10 years. Most of Uganda's known oil reserves are located along Lake Albert and the D.R.C. border, in one of Africa's most ecologically sensitive areas. Uganda and several private oil companies had hoped to begin small-scale production as early as 2012, but production has been delayed due to a capital gains tax dispute and a parliamentary resolution blocking new agreements with oil companies pending passage of oil legislation. Potential construction of a domestic oil refinery and export pipeline are contingent upon ongoing feasibility studies and negotiations between oil companies and the government. Roads are the most commonly used transportation infrastructure in Uganda, accounting for more than 90% of cargo freight and passenger transportation. 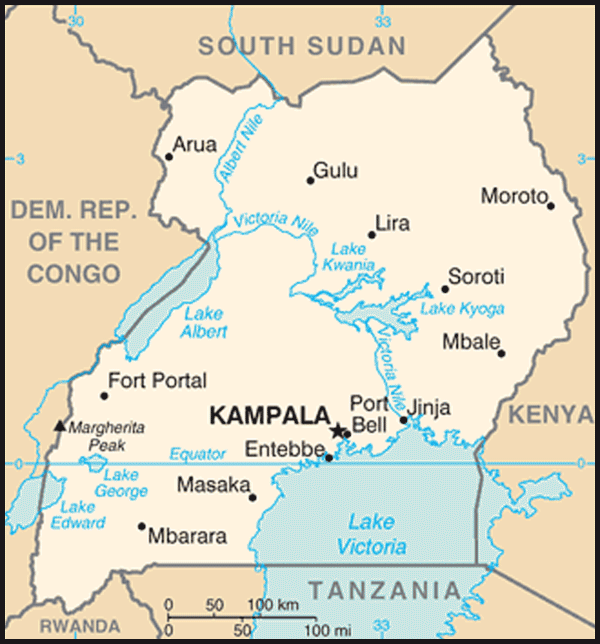 Uganda has about 78,100 kilometers (48,529 mi.) of roads. Only 3,000 kilometers (1,864 mi.) are paved, and most roads radiate from Kampala. The country has a 321 kilometer (200 mi.) rail network, much of which is not currently in use. Uganda's road and rail links to Mombasa serve some of the transportation needs of the neighboring countries of Rwanda, Burundi, and parts of D.R.C. and Sudan. Entebbe International Airport is on the shore of Lake Victoria, some 32 kilometers (20 mi.) south of Kampala. The Ugandan Government generally seeks good relations with other nations without reference to ideological orientation. Uganda's relations with Rwanda, D.R.C., and Sudan have sometimes been strained because of security concerns. Uganda, D.R.C., Rwanda, and Burundi participated in the U.S.-facilitated Tripartite Plus process, which helped ease tensions and contributed to increased bilateral contacts with the aim of resolving conflicts between the neighbors. Uganda has more than 5,000 peacekeepers in Somalia as part of the African Union Mission in Somalia (AMISOM). In addition to its friendly ties to Western nations, Uganda has maintained ties with North Korea, Libya, and Iran. 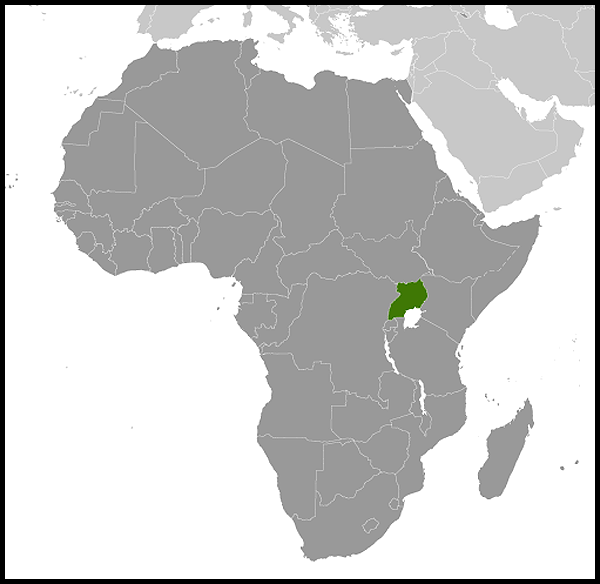 The Allied Democratic Forces (ADF), a rebel group operating in western Uganda and eastern D.R.C. near the Rwenzori Mountains, emerged as a localized threat in 1996 and inflicted substantial suffering on the population in the area. It has largely been defeated by the Uganda People's Defense Force, and the affected areas of western Uganda have been secured. Remnants of the ADF remain in eastern D.R.C. The Uganda People's Defense Force (UPDF) — previously the National Resistance Army — constitutes the armed forces of Uganda. The UPDF's land and air forces have 50,000 soldiers, including approximately 6,000 currently deployed to AMISOM and the Operation Lightning Thunder (OLT) counter-LRA operations in central Africa. As the first country to deploy troops to AMISOM when it was established in 2007, Uganda has played a key and growing role in advancing regional peace and security. In recent years, the UPDF has become a modern and professionalized force that has largely moved beyond the human rights abuses committed during its military intervention in the D.R.C. in the 1990s. However, there are still reports of human rights abuses committed in the UPDF's ongoing Karamoja disarmament campaign in eastern Uganda, and some UPDF entities are alleged to have committed human rights violations with other organs of Uganda's security apparatus against the political opposition. Although U.S.-Ugandan relations were strained during the rule of Idi Amin in the 1970s, relations improved after Amin's fall. In mid-1979, the United States reopened its Embassy in Kampala. Relations with successive governments were cordial, though Obote and his administration rejected strong U.S. criticism of Uganda's human rights situation. Bilateral relations between the United States and Uganda have been good since Museveni assumed power, and the United States welcomed Museveni's early efforts to end human rights abuses and to pursue economic reform. U.S. assistance to Uganda promotes democratic governance, peace and security, and local development. In FY 2011, the United States provided over $600 million in assistance to Uganda. The President's Emergency Plan for AIDS Relief USAID (CDC (http://www.pepfar.gov/) PEPFAR) works with the U.S. Agency for International Development (http://www.usaid.gov/) and the Centers for Disease Control and Prevention (http://www.cdc.gov/) to fight the HIV/AIDS pandemic. In FY 2011, the United States provided approximately $285 million in PEPFAR assistance to prevent the spread of HIV/AIDS. Other U.S. health assistance to Uganda targets malaria, family and reproductive health, child and maternal health, tuberculosis, and other infectious diseases. Other programs promote trade and investment, curb environmental degradation, encourage the peaceful resolution of local and international conflicts, and promote honest and open government. U.S. Peace Corps (http://www.peacecorps.gov/) volunteers are active in primary-teacher training and HIV/AIDS programs. The Department of State carries out cultural exchange programs, brings Fulbright lecturers and researchers to Uganda, and sponsors U.S. study and tour programs for a wide variety of officials from government, nongovernmental organizations, and the private sector. Through the Ambassador's Self-Help Fund, local groups in poor areas receive assistance for small projects with a high level of community involvement. U.S.-Ugandan relations benefit from significant contributions to health care, nutrition, education, and park systems from U.S. missionaries, nongovernmental organizations, private universities, HIV/AIDS researchers, and wildlife organizations. Expatriate Ugandans living in the United States also promote stronger links between the two countries. The U.S. Embassy in Uganda is at 1577 Ggaba Road, Kampala; tel. +256 414-259-791; fax: +256 414-259-794; (http://kampala.usembassy.gov/). Northern Uganda Virtual Presence Post - (http://northernuganda.usvpp.gov/).